You choose the Genre and enjoy the Journey! ALL MY BOOKS ARE AVAILABLE ON AMAZON!!! Please check them out. STOP the Hate...STOP the Anger.......LISTEN!!! LOVE is stronger than both... if you acknowledge it! Check out "The Threshold" and see who you relate to. The Threshold - A Spiritual Journey to understanding your fears. 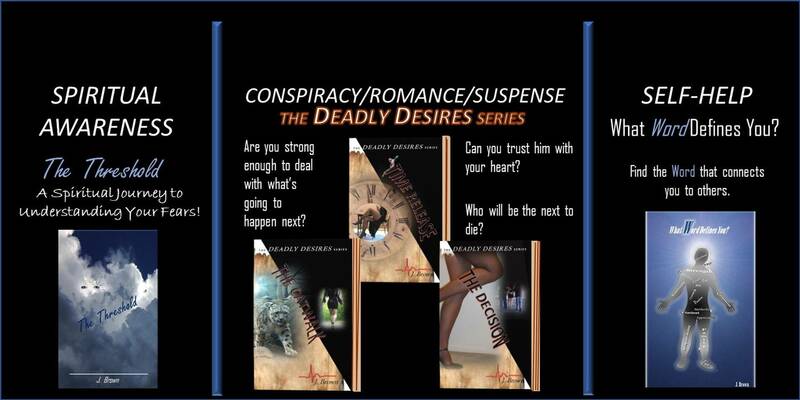 The Deadly Desires Trilogy - Twists/Turns - Edge of your seat suspense and sexual tension. WhatWord Defines You? - Self-Help -Find a friend/a love/a company that compliments who you are. KDP Select Members can read many of my books for FREE on Amazon. AUDIO BOOKS are coming soon!!! Check back early next month! Twists and turns once again. I finished the audio version of my first book, "Time Release." However, when submitted to ACX, it had floor noise. It would be 3 hrs a chapter to redo. If anyone knows of someone who can take out floor noise, I'd be interested in finding out. Just leave me a comment or email me at triacia37@gmail.com. And those of you, who still prefer to hold a book in your hands, please be sure to go to Amazon and order a soft cover or download to your kindle. Either way, the story and my characters will take you on a very special journey. As always...thank you for visiting my website. Be sure to check out the individual pages and watch my videos as well.